I just wanted to say Happy Birthday to my brother Tony!!! 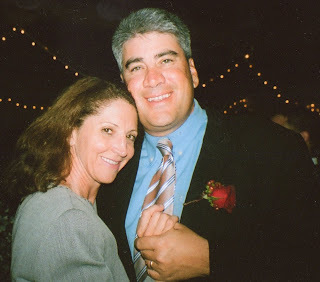 This is a picture of him with his wife Debi, at my daughter's wedding this past October. 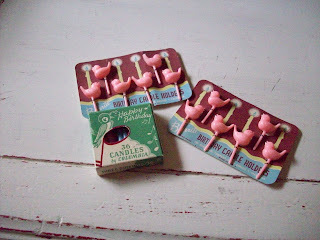 Remember a few posts ago, I told you about the little vintage birthday candle holders that I got from EBay? This is what I did with some of them. 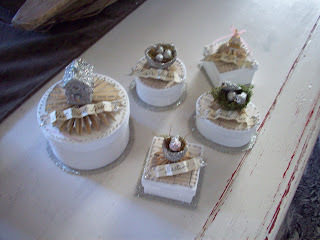 I made little birthday cake boxes. This is the small version. This is the lager version. I had fun making them, and they turned out looking like cakes, which is what I was going for. We are having Springlike weather here today, yay! 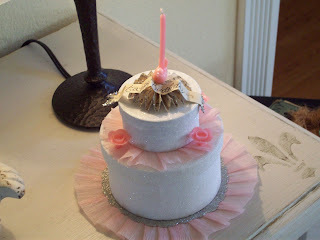 So I need to go and get busy, but I just wanted to say hi, and share some cake with you. Spring Has Sprung, At My House!! 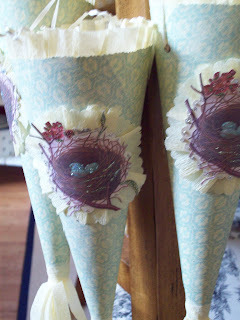 I have been busy working on these Spring cones today!! 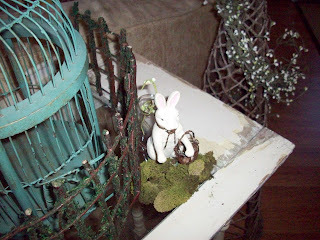 I thought I would show you a few of my other Springy things, around the house. 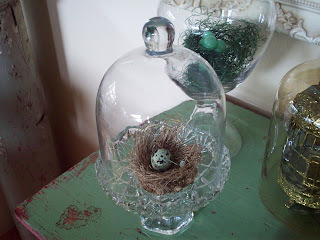 I went to Garden Memories yesterday, and bought this nest. Well actually I bought two of them. Barbara always has the best eggs, birds and nests. She has a great eye for these, she has a great eye for everything. I couldn't resist this robin either. I knew if I didn't buy one, they would all be gone in a week. 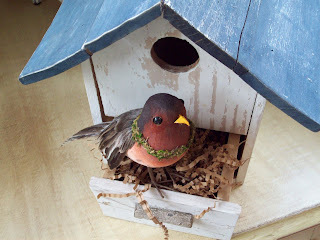 This is what I did with the second nest. Here is what happens to me, every time I see a new one in the shop, I have to get it. 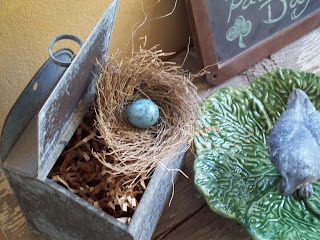 Now I have nests here and there, all over the house. I like them all year long, but particularly this time of year. Hope it clears soon for those celebrity dos!! Busy Week!! 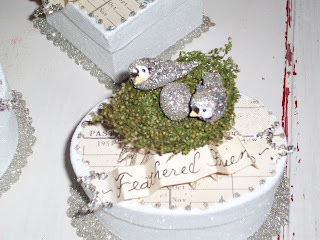 Boxes, and Birds!! It's been a busy week!! 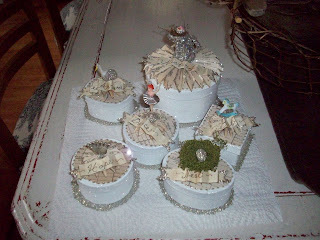 I have been creating more of my boxes!! Some for Garden Memories, and some for special orders. I took a picture of some I just finished this morning. I have a cold, so this glittering, and gluing keeps my mind off of that. Thanks for all of your complements on my daughter's tile redo!! Maybe sometime I can come up with some how to directions for any one who wants to try it. Now for some pink birds. Aren't these cute? 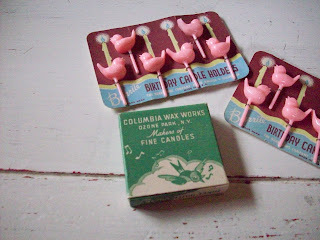 These are vintage birthday candle holders. I got them from ebay. 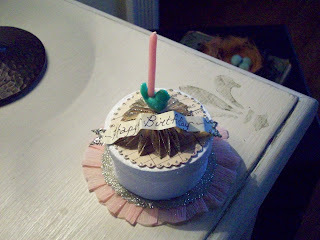 They even came with the original birthday candles. I love the graphics on the box. I originally saw some like these on Andrea's One Hundred Wishes website, but she sold out in 2.8 seconds. (Yay Andrea) I was a little bummed out about that, so I tried ebay, and was amazed to find some, and didn't get outbid like I usually do. What is it that I am going to do with these you are asking yourself? 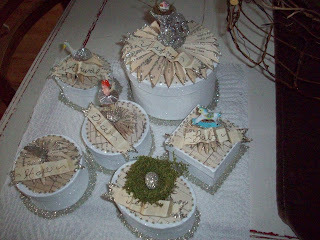 I am going to use some on the tops of my little boxes. 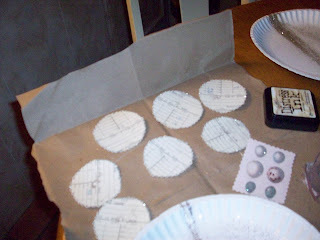 I am also going to try to make a large round box, like a birthday cake. I will show you when I figure it out. I just thought they were very cute!! So that is what I have been doing this week. I hope you are all having a good week, with great plans for the weekend. 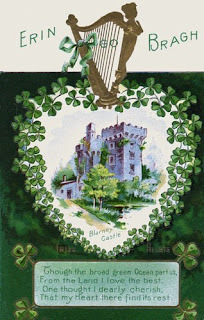 Spring, St. Patrick's Day, and Amanda's Tile!! Hope you are all having a nice holiday Monday!! I wanted to show you some of my Spring/St. Patrick's Day decorating. 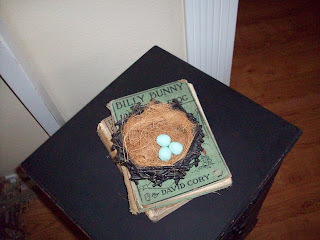 Old books, with bird nest. A little vignette in progress. Spring has sprung. I got this cute little lamb at a thrift store for $2. 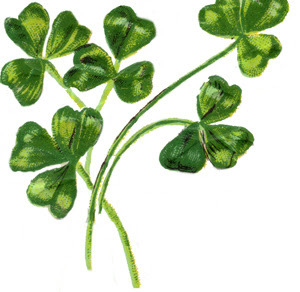 He already had tiny shamrocks around his neck. More green. 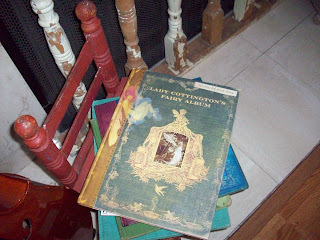 I love these fairy books. They are made to look old, but they are new. They have beautiful illustrations. A bunny from Garden Memories. Now, here is what I have really been up to this weekend. I spent Saturday and Sunday at my daughther Amanda's house. We were painting her kitchen. Couldn't really get a good picture of the wall color. It is a Tuscan yellow. That deep golden yellow color. 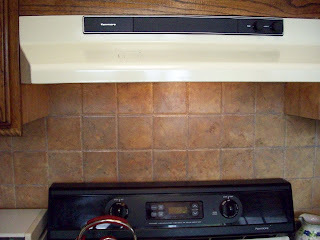 Now picture tile behind her stove, a shiny white 1980's tile with little pictures of herbs here and there. She did not like it. So in comes mom, queen of the paints. 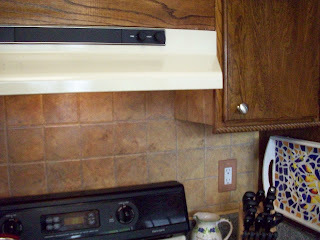 I say lets paint over the tile and make it look like tumbled stone. Well, it was a big job, but I did it. Here are the after pictures. Did not have my camera, when we started. I know you are picturing that old 1980's tile in your head. We thought it turned out pretty good!! I think you can click to make larger. I primed and painted. 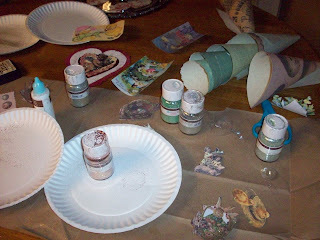 Then I pulled out my craft paints, and went to work. I put on poly at the end, so she could wipe off any splatters that may happen. We were really excited with the finished project. I am taking a little break today. 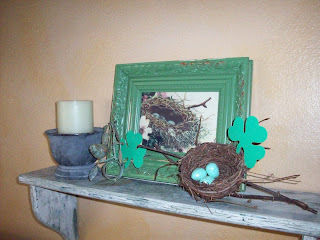 So I have started a little St. Patty's Day/Spring at my house. 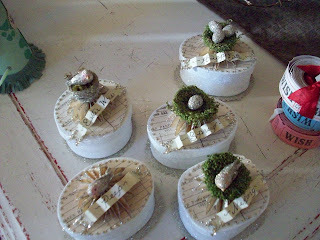 I am off to Ventura to Garden Memories to drop off more goodies to Barbara. Later this afternoon I am going to help my daughter paint her kitchen. 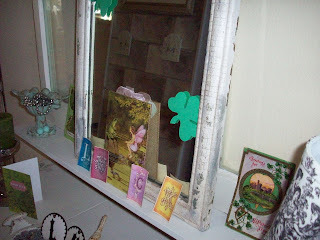 I will be back soon with some pictures of my St. Patty's Day/ Spring house update. Have a lovely Saturday!! The sun is bright, and it is suppose to be in the high 60's today. I hope you all have a lovely and romantic day. I think Cupid looks a little tired. All of that arrow shooting, I guess. 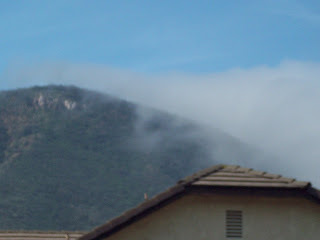 I walked out my front door earlier today, only to see the fog creeping over our hills. I thought it looked so cool, I had to take a picture of it. We don't live that far from the beach, so we have a coastal type climate. 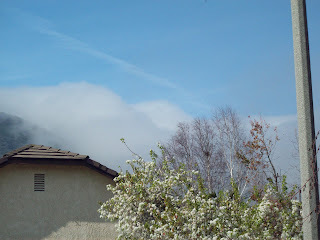 The last few days has been rather warm for February, but now the fog is cooling things off again. I love the fog ! I saw this hydrangea at Trader Joe's, so I had to buy it. 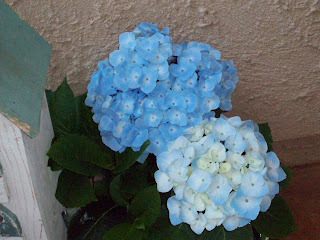 The color is amazing, and my hydrangeas aren't nearly ready to bloom. Now I have my little touch of Spring. I have been working on more Spring boxes this week. They are selling quite well, and I am trying to keep up with them. Hope you are all having a good week so far, and you are getting ready for a romantic day tomorrow. Today we went to my Aunt's 80th birthday party. 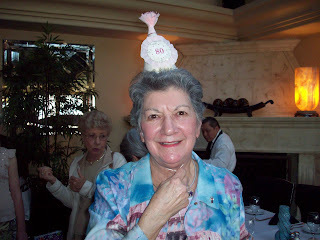 She is wearing her party hat I made for her. I don't think she looks 80. 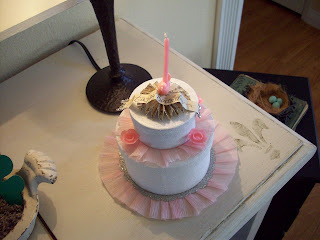 Every year she throws herself a party, because she loves birthdays, and parties! Here is a picture of the Newlyweds!! My daughter Amanda's new haircut! (Isn't it cute)? 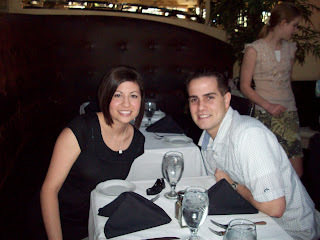 After the honeymoon, she had her hair cut, and donated it to Locks of Love. This is my cousin and his wife. Aren't they a cute couple? 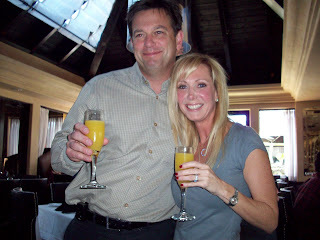 ( The Mimosas were great)! I wonder who this couple is? I know some of you are having the worst cold weather. You probably won't like this, but we had 80's today in Southern California. It was abnormally warm for February. I'm sure next week will be back to winter weather, but for now it felt wonderful!! Just like Spring. 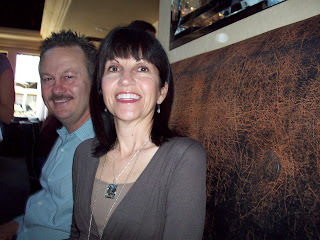 Well we all had a fun time at the party, and my Aunt was already planning next years event. Hope you are having a fun day too! 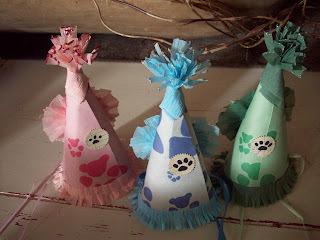 Pet Party Hats and more!! 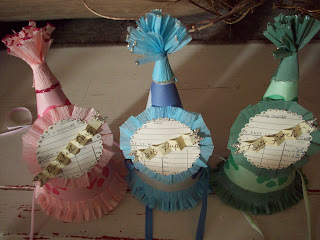 I had a special request for pet party hats, and here they are. I thought you might get a kick out of these, as I did. This is what I was up to today. Here are some of my new Spring boxes. 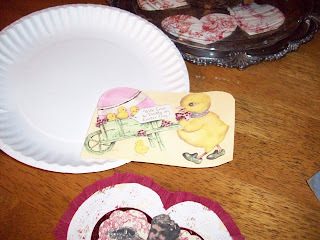 Then in my spare time, I made up some Valentines. Time for me to go clean up the glitter, and watch American Idol. ps, spell checker still not working. Awards and Charms or Charming Awards! I just got back from Monday night dinner with Amanda. 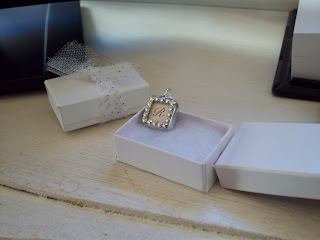 I gave her a new charm that I ordered for her from Martha, at mj ornaments. I got one too! This is mine down below. 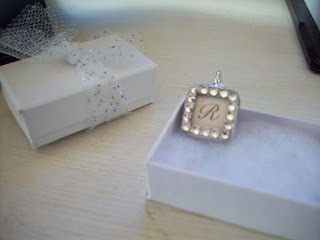 They are beautiful initials, under glass, with pretty sparkly crystals around it. Martha does lovely work. 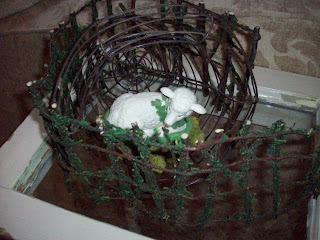 Visit her new blog at, http://www.mjornaments.blogspot.com/ You can get to her website that way. They are most charming Martha!!! They are so tiny and cute, and come in the tiniest box. 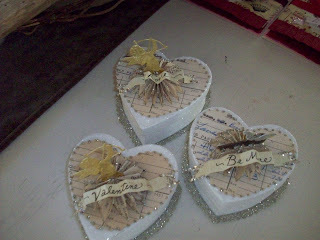 On the back is a tiny piece of vintage paper with beautiful old script. Since I was working on projects all day, it was fun to have these charms arrive in the mail today. The other thing that happened today was, this You Make My Day Award! I received it from 2 people on the same day! I must be doing something right. Please visit their blogs if you haven't had a chance. They are both creative, and lovely ladies. Thank you ladies so much for thinking of me today!! 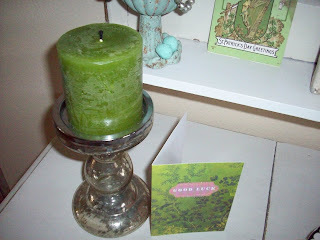 I would like to pass this award on to Jamie of Simply Me Art http://www.simplymeart.blogspot.com/. She always has a great post, and is a sweet, and talented friend. 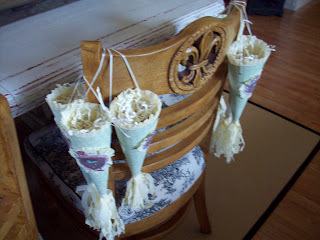 Also to Jennifer Grey, at www.theoldpaintedcottage.com/ Jennifer has been nice enough to sell my paper art on her lovely website. Thank you Jennifer! 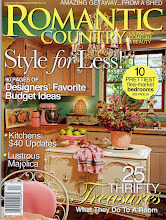 Jennifer also has the Cottage of the Month, and if you haven't seen February yet, go check it out. It is a beautiful Shabby Chic home in Australia. Flea Market Was A Bust!!! Hope you all had a great weekend, and are enjoying football, if you like that sort of thing. Mark and I got up early to go to the Ventura Flea Market. When we got up it was raining. Who cares, it's only water. This particular flea market always advertises, it's on rain or shine. I can shop with an umbrella. Anyway, we get there, and they cancelled. I was a little sad, but we left, and went to get breakfast instead. I did have to be in Ventura anyway, to drop off a few things for Barbara. I didn't get my flea market fix though. I am having that deprived winter kind of thing. Not too many flea markets, and not too many yard sales. Thank goodness Spring is on it's way soon. I got home, and started right in on my projects. 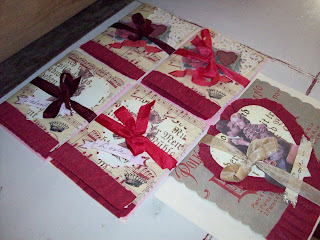 I am working on some samples for another shop. This one is in Cambria. The owner wants some samples of my work. 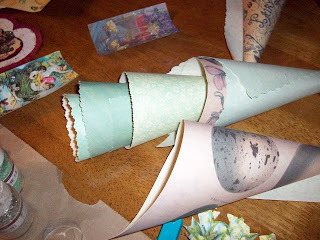 I am working on some Spring cones and boxes. That is why I haven't visited you all for a couple of days. I wanted to say hi, and let you know what I have been up to. Some graphics are from the Graphics Fairy!! Check out her blog sometime. She has the prettiest graphics for you to use. Have a nice night, and a great week.